The Arena Lacrosse League’s final four is set for this Saturday and Sunday at the Iroquois Lacrosse Arena in Ohsweken. Three teams were eliminated from the chase for the ALL Cup last weekend in quarter-final play at the Toronto Rock Athletic Centre in Oakville. The Whitby Steelhawks defeated the Peterborough Timbermen 12-7, the Paris RiverWolves beat the Six Nations Snipers 20-11 and the Oshawa Outlaws were victorious over the Toronto Monarchs by a score of 14-12. The St. Catharines ShockWave, first place finishers in the regular season, had a bye through to the semi-finals. The ShockWave will take on the Steelhawks at 4 p.m. Saturday, and quite honestly that game could be better than the eventual final. If you looked only at the standings, you would see that Whitby finished in last place and thus called them a long shot to beat the second place Timbermen. However, Whitby was much better than their record, especially towards the end of the season. They finished 4-2 in their last six games; they came together just in time to defend their 2018 championship. Rookie of the year Austin Murphy came back and put up 15 goals and 16 assists in five games. JP Kealey was returned from the New England Black Wolves and scored nine points in the one game he played. Veteran defenseman Mark Farthing returned for the playoffs from a near-season long hand injury. Now they are looking to go back-to-back against a ShockWave team that lost only one game during the regular season. 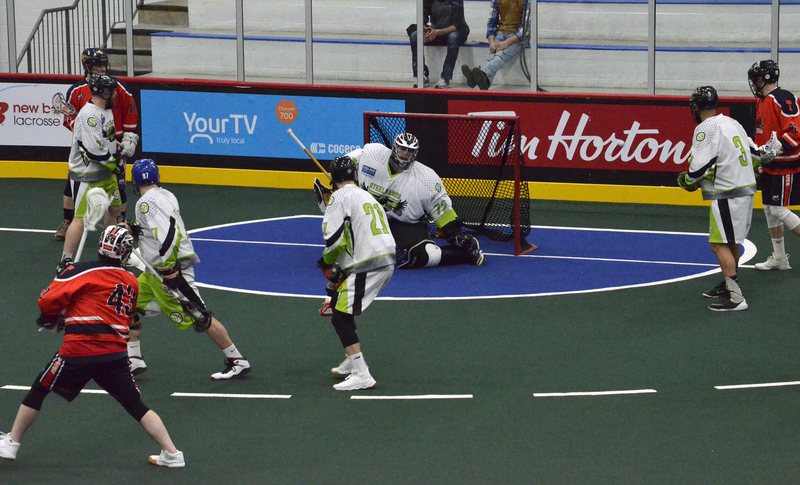 Against Peterborough, the Steelhawks led 4-1 at halftime. Both goaltenders, Nick Damude for Peterborough and Lukas Coote for Whitby, were fantastic, equaling each other save for save. Peterborough came out of the gate on fire in the second half, scoring five times to suddenly lead 6-4. Their captain and leading scorer Mark Vradenburg capped his day with a hat trick to start the fourth quarter, but that’s when Whitby kicked it into an even higher gear. The Timbermen were powerless to stop the onslaught. Austin Murphy scored four times including a natural hat trick in under a minute. It was a disappointing end to the season for the much-improved Timbermen, who finished last in the first two years of the league’s existence. The Outlaws and RiverWolves will play each other in the league’s second semi-final at 7 p.m. on Saturday. The RiverWolves finished in third place and defeated the sixth place Snipers with a 10-goal effort in the second quarter, leading 12-7 at halftime. Spencer Pyke had 10 points (4G/6A), while the rest of the RiverWolves’ scoring committee also had strong games: seven points each for Eddie Renaud and Dan Keane, six points for Josh Medeiros and five each for Matt Lee and Cole Spear. Oshawa, winners of the inaugural ALL Cup in 2017, finished in fourth place and defeated the fifth-place Monarchs, who started the season strong but ended on a six-game losing streak. It was 5-3 Monarchs at halftime – 18 goals were scored in the second half. The Monarchs actually led until the 4:29 mark of the fourth, when Oshawa began to really push back. They tied the game at 11 and then took a one-goal lead. Toronto, losing steam, tied it at 12 before Geoff McNulty scored the winner. League-leading scorer John St. John led with five goals and a pair of assists. In the semi-finals it will be 1 vs. a very strong 7 and 3 vs. 4 with the final set for Sunday afternoon at 3 p.m.